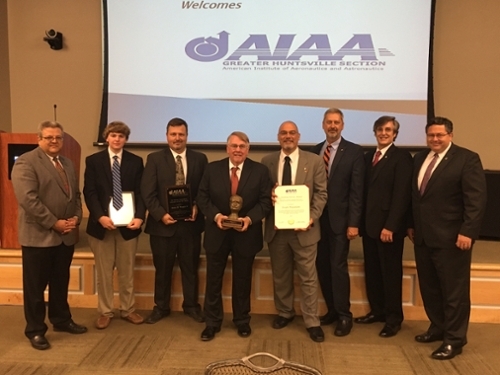 The Department of Aerospace Engineering at Auburn University was recently recognized with several awards at the 64th annual Section Awards Dinner and Council Installation Ceremony sponsored by the American Institute of Aeronautics and Astronautics Greater Huntsville Section. Butch Foster, professor emeritus of aerospace engineering, won the prestigious Hermann Oberth award. This highly competitive recognition is reserved for an individual who has contributed outstanding achievements in the field of astronautics while promoting the advancement of aeronautical sciences. Eldon Triggs, lecturer of aerospace engineering, received the Konrad Dannenberg Educator of the Year award. This honor is extended to an AIAA member who has demonstrated exceptional service to education and the promotion of math and science within the local community. Joe Majdalani, Francis Chair of Excellence in aerospace engineering, was presented with the Sustainable Service award for his 25 years of dedicated service to AIAA. Majdalani also received a certificate of appreciation from the greater Huntsville Section and was elected as director for honors and awards for the Greater Huntsville Council. Todd May, director of the Marshall Space Flight Center in Huntsville and ’90 materials engineering graduate, introduced the keynote speaker Kay Ivey, lieutenant governor of Alabama. Ivey was also the recipient of the 2016 AIAA Public Service award. For more photos from this event visit: https://www.flickr.com/photos/auburnengineers/albums/72157669426074440.